Centipedes are small, passive creatures that are generally found in wooded areas and caves. They are incapable of attacking, and will always die with one hit. They usually yield Crawlers when killed. 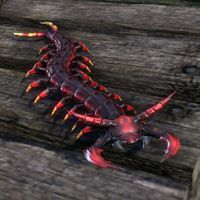 Glow Bugs - a variation found in Evergloam and The Mind Trap in Eldbur Sanctuary. This page was last modified on 25 June 2018, at 19:53.